The Geovista Digital Borehole Geophone system includes a down-hole digital sonde and a compact digital interface unit at the surface. There is no requirement for a seismograph. The sonde runs on a single conductor (up to 1000m of 3/16” cable), on a standard logging winch. It includes a motorized clamping arm and three SM24 geophones arranged in an X-Y-Z pattern. The motorised clamping arm allows for work in a range of borehole diameters, by ensuring adequate coupling for the seismic signal. The geophones are non-gimbaled, 3 axis devices, allowing for seismic energy to be measured in X and Y horizontal axis and in the vertical Z axis. The digital interface unit at the surface has inputs for the down the hole sonde, three surface geophones and the trigger. This unit also reads pulses from a depth encoder to provide depth information to the software. Collected data is output to a PC via the USB port. The acquisition software allows for data viewing and stacking. The generated SEG2 files can then be imported into most commercial seismic processing software. 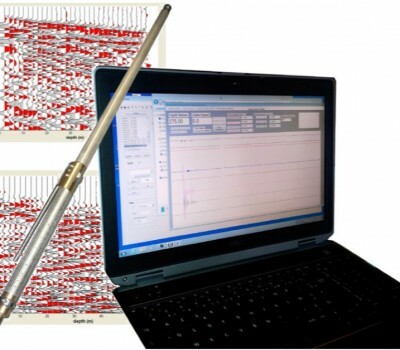 The Geovista Analogue Borehole Geophone system includes the same downhole SM24 geophones as the digital version and the same motorized clamping arm. This tool can only be run on 4-core cable up to 2000m. A third-party surface seismograph must be used at surface to read the analogue signals. It comes with an analogue interface unit at surface that controls the downhole caliper arm and relays the analogue signal to a seismograph. Output file format: SEG2 Oper.